Although, at first glance, it doesn't appear like such a big deal. Reaching this milestone is important for any young Major League hopeful. You work hard you entire young career to be considered, and you can't play for the big club until you get there. The 40-Man Roster, sometimes called the expanded roster, consist of all players who are signed up to a Major League contract. Therefore, they can, at any time during the season, be placed on the active 25-man roster. This means that once you reach the 40-man plateau, you are more likely to see some real time in Los Angeles. The other day, in preparation for the Rule 5 Draft in December, the Dodgers added 3 new names to their 40-man roster, and they represent 3 young arms who may to be ready to contribute on the mound. They are Pedro Baez, Yimi Garcia and Jarret Martin. In celebration of this stepping stone, I put together fantasy Baseball cards for them. Check them out below. I've also added some background and statistics to help familiarize yourself with them. 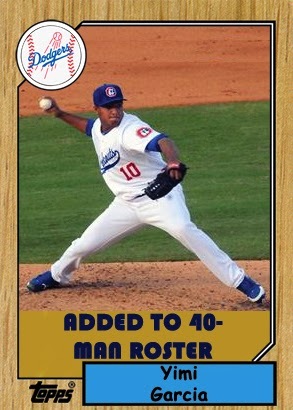 Pedro Baez is a 6'2" right-handed pitcher from the Dominican Republic. He spent the first 6 years of his professional career as a Dodger infielder, but couldn't hit a lick. Then, in 2013 he went to the mound and has impressed the Dodgers staff. He went a combined 3-3 with a 3.88 ERA in 48 games with Single-A Rancho Cucamonga and Double-A Chattanooga. Could he be the next Kenley Jansen (he was a converted catcher)? Via Ken Gurnick at MLB.com from last Spring Training. Baez showed Koufax a natural delivery, a fastball in the mid-90s and a curveball more advanced than many of his fellow Minor Leaguers who have been at this pitching thing for years. Koufax told other staff members he'd like to see Baez in a game this spring. There's no better way to start a pitching career then to impress Sandy Koufax during your first bullpen session with the Hall of Famer. Below are his Minor League statistics, via Baseball-Reference. Yimi Garcia is a 23 year old right-hander from the Dominican Republic. He is probably the most exciting prospect of this group, and is likely to be the first one of the three to wear Dodger Blue. Garcia, 23, was a Double-A Southern League All-Star in 2013, going 4-6 with 19 saves and a 2.54 ERA in 49 games with Chattanooga. 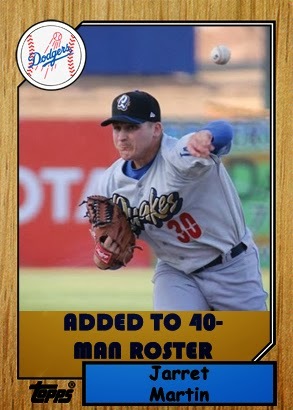 The Moca, Dominican Republic native, who also played for the Desert Dogs in the Arizona Fall League following the season, limited opponents to a .164 batting average this year, while striking out 85 and walking only 14 in 60.1 innings. Right now, in the Arizona Fall League, he has pitched in 10 games, and has limited batters to a .227 batting average. Yimi throws a legitimate strike out slider that may be one of the best in the Minors and is considered MLB ready. 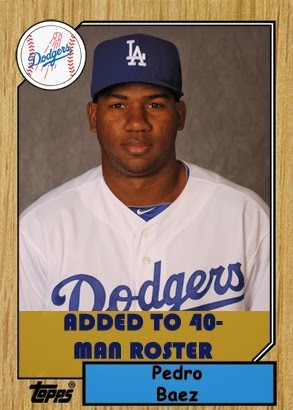 Jarret Martin originally came over to the Dodgers as a part of the Dana Eveland trade in 2011. He is a hard throwing left-hander who can reach the mid-90's with a fastball that has some sink and run, and has a decent slider that he uses as an out pitch. Since coming to the Dodgers he has reworked his mechanics to use more of his legs, and has seen positive results. Hopefully, he can continue advancing, as it appears his control problems may be a thing of the past. Martin, 24, combined to go 6-7 with two saves and a 4.30 ERA in 40 games (14 starts) with Rancho Cucamonga and Chattanooga during the regular season before a stint in the Arizona Fall League. Martin, who was acquired in a trade with Baltimore in December 2011, posted a 2.77 combined ERA (8 ER/26.0 IP) in his 26 relief appearances this season, including a 1.69 mark (2 ER/10.2 IP) in 11 games during a late-season promotion to Chattanooga. The Dodgers held their 9th annual turkey giveaway for needy families yesterday afternoon. Pic above via Jon SooHoo/La Dodgers 2013. 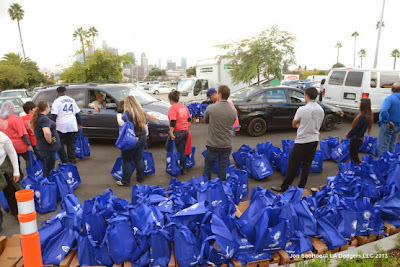 Via Ron Cervenka at Think Blue LA, "Michael Young – The Dodgers’ 2013 Invisible Man". Awesome! Matt Monagan at Cut4 breaks down a video of Hyun-Jin Ryu bloopers from a ramen noodle commercial he recently did. Craig Calcaterra at Hardball Talk breaks down the postseason playoff shares. Dodger players received $108,037.06 each, 58 players received full shares, 11.5 partial shares and 8 cash awards. 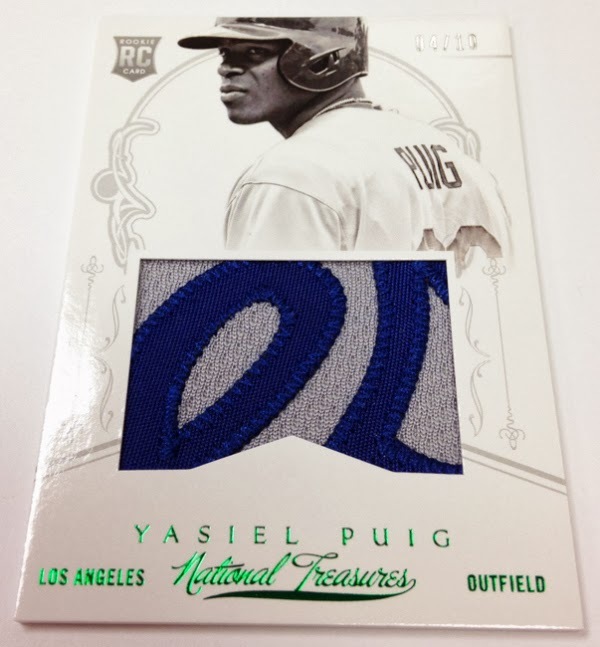 Blowout Cards shares some preview images of some Yasiel Puig patch cards that will be in 2013 Panini America's Pastime Baseball card set. See them below. Go here to see more preview images. Via Chad Moriyama writes, "Kirk Gibson latest D-Backs figure to join franchise’s faux macho BS press tour against Dodgers". Chad Moriyama also writes, "An interview with prospect Corey Seager during the Arizona Fall League". 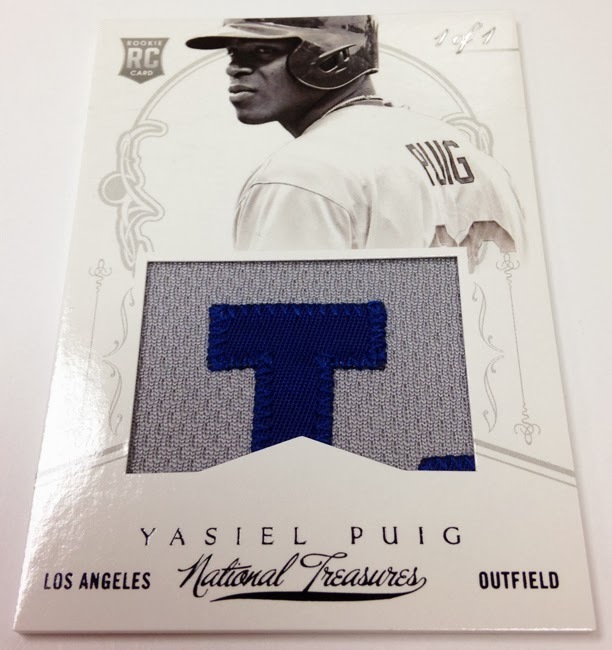 Via @toppscards on twitter - An early look at 2014 Heritage. Check out the Kemp card below. This is just creepy. Mike Oz at Big League Stew tells us about the Shane Victorino and David Ortiz playoff beard hair currently for sale on eBay. BTW, the Dodgers will have a Blue Friday sale at Dodger Stadium after Thanksgiving.